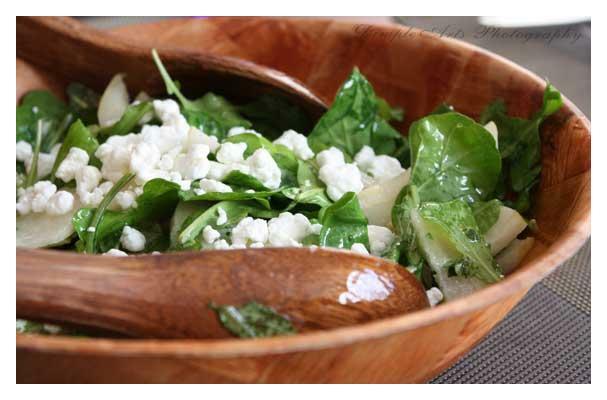 Salad refers to a variety of dishes consisting of foods that are often mixed with a dressing. Vegetable salads, meat salads and pasta salads are all popular varieties. A green salad generally has lettuce or some other leafy green vegetable as a base which is then topped or tossed with other ingredients such as chopped vegetables, fruits, nuts, cheeses, meats, or anything else that one wants to put on it.Salad is usually served as a first course at dinner in America. Soup and Salad are a popular combination, especially during lunch. Salad could be eaten by itself as a meal or combined with a meat, fish or chicken dish. Salad ingredients are tied together with dressings. Dressings typically include a fat, like an oil or bacon grease, with an acid like vinegar or citrus juice. Additional possible ingredients include eggs, anchovies, herbs, spices, garlic, onion, soy sauce, nuts/seeds, cheeses, and mayonaise or sour cream. There are many flavors for salads, depending on the type of vegetables used in it and the type of salad dressing used to dress it with. Fruits, nuts, meats, cold cuts, chicken or seafood can be added to salads to enhance its flavor or add to its nutritional value. The word "salad" is from the Latin "sal" for salt because the first salads of Rome used salt for dressing. In Middle English it was known as "salade". In the 19th century, it can be found in American cookbooks spelled as "salat". Salads are an important course in most cuisines. They are known by different names around the world for example French say salat, Italians insalata while Spanish say ensalada. Today the importance of salads have increased as more and more people are looking at salads as an healthy options in their menu. Thus great emphasis is placed on the variety of salads offered on the menu.